Lemon is one of the most widely used citrus fruits, because it is inexpensive, and tastes good. It is usually used to make refreshing drinks like lemonade, tea, and cocktails, but it also has health benefits, which is why it is used as medicine in some parts of the world. These days, more people are starting to realize the health benefits of lemons, and have started drinking lemon water on a daily basis, especially in the mornings, because it is easy to make, and a healthier alternative to coffee. 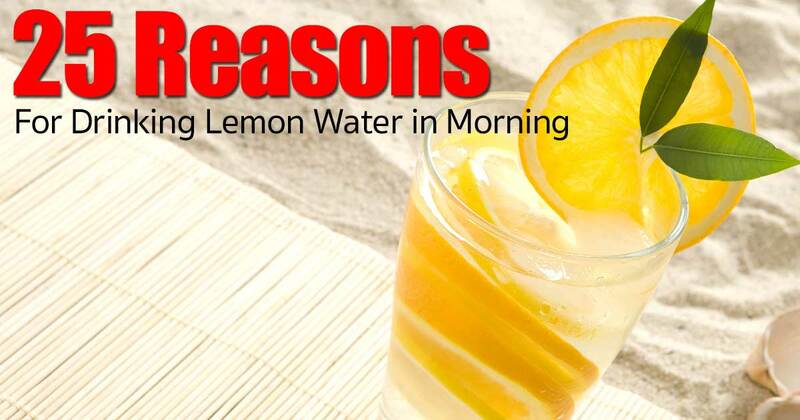 If you are interested in learning more about the benefits of drinking lemon water in the mornings, take a look at these 25 reasons why you should drink it in the morning before you eat. As previously mentioned, making Lemon Water is very easy, all you need is a fresh lemon and some warm water. You should wash your lemon thoroughly and cut it into half, after cutting it, you should squeeze half of the lemon into a mug. Once the juice is in the mug, add warm filtered water into the mug, stir it, and it is ready to drink. For people that enjoy hot beverages in the morning, don’t use hot water to make your lemon water, because the heat from hot water destroys some of the enzymatic properties and vitamins in the lemon. The lemon water is more effective if you drink it 30 minutes before eating breakfast, and if it tastes too tart, you can add a tablespoon of honey to sweeten it. #1 It helps your digestion by flushing the digestive system, and the water helps to keep your body hydrated. When you sleep, you don’t drink any water for up to eight hours or more, so drinking water when you wake up is essential to get your body and mind going. #2 It gives your immune system a boost because of the Vitamin C and potassium that the lemon contains. Drinking it early in the morning allows your body to absorb the vitamins effectively and improve your immune system. #3 It can help you maintain a healthy weight, because research has shown that drinking lemon water increases your metabolism. #4 It provides a natural flush, because it helps the liver perform its job more effectively, and it also helps flush your body by helping to stimulate the proper production of stomach acid and bile. #5 It gives you healthier skin, because it helps your body flush out toxins and improves your digestion, and the Vitamin C in the lemon helps to increase collagen production, which gives you smooth and healthy skin. #6 Lemon water provides an extra energy boost, because it helps the digestive system, and the lemon juice provides energy when it passes through the digestive tract. #7 It helps to elevate a person’s mood, because it has a lot of negative charged ions that help to reduce anxiety and even depression, when released in the body. #8 Lemon water helps to cure throat infections like tonsillitis, because the lemon has antibacterial properties that help to heal the infections, and the warm water also helps to soothe the pain. #9 It greatly reduces your chances of having anemia or cataracts, because the Vitamin C in the lemon increases the body’s absorption of certain ions that decreases the chances of anemia. At the same time, drinking lemon water on a daily basis provides your body with high levels of Vitamin C, and doing so over a long period of time, decreases you chances of having cataracts. #10 Lemon water also helps when it comes to dental care, because drinking it in the morning helps to relieve toothaches, and other gum related problems, because the ascorbic and citric acids in the lemon kill the bacteria that lead to dental problems like bleeding gums. #11 If you drink lemon water on a daily basis, the acids that are in the lemon can help dissolve gall stones, kidney stones, and calcium deposits in the body. This is possible because the daily intake allows the acids to gradually dissolve them before they become harmful. #12 Lemon water helps to relief heartburn, which is caused by an over acidic diet. While lemons contain acids, it leaves an alkaline residue in the body, which helps to combat the acidosis in your body, relieving you of your heartburn. #13 Lemon water is beneficial to pregnant women, because it makes them less likely to throw up, keeps them hydrated, and the Vitamin C also helps with the formation of bone tissue in the baby. #14 It protects people from rheumatoid arthritis, because most arthritis pain is caused by an excess of uric acid deposited in the joints, and lemons have properties that are effective against uric acid. #15 The lemon has elements like magnesium, iron, and calcium, which have proven to be very effective in repairing our lymphatic system. Health problems like high blood pressure occur because of problems in the lymphatic system, so drinking lemon water daily is a good way to reduce you blood pressure. #16 As previously mentioned, the lemon leaves an alkaline residue in the body, this also helps your body maintain a high pH level, which helps your body to fight diseases better. #17 It helps to clean your liver, and remove toxic substances that may harm its proper function, and result in health problems. #18 Lemon water actually helps to reduce bad breath, because destroys odor causing bacteria, and also gets rid of the white plaque that forms on your tongue while sleeping. #19 It is a regular source of potassium, which is something that is needed for the proper functioning of the cardiac and nervous systems in our bodies. #20 It is a natural diuretic, because it helps us to get rid of the unwanted toxins in our body at a faster rate, and also keeps the urinary tract clean at the same time. #21 The Vitamin C and ascorbic acids in the lemon helps our bodies heal faster, and also help with the growth of bones, tissues, and cartilages. #22 It helps to prevent the multiplication of pathogenic bacteria, which are the bacteria responsible for infections and diseases in our bodies. #23 The flavonoids in lemons are very useful in preventing cholera. #24 Lemon water has limonoids, which have anti carcinogenic properties, which help to prevent certain cancers. #25 Drinking lemon water on a daily basis helps you break your dependence on coffee, and is a much healthier alternative. These are just some of the benefits of drinking lemon water, there are a few more benefits to drinking it daily, but these should be enough to convince you.